The chief external differences from the Mark I Tank lay in the tail wheels, which were not used on the Mark II Tank and later heavy tanks, the narrower driver’s cab and the ‘trapezoid’ hatch cover on the roof. Only fifty tanks each of Marks II and III were produced. They were unarmoured, in the sense that the steel from which they were built was not heat treated to make it bullet proof. The reason being that these tanks were only intended for use as training machines. Built as a Male Tank, No. 785 took part in the battle of Arras, April 1917. It bears a number of scars from this battle towards its rear. Various features, in particular the hinged hatch on the cab roof and internal modifications show that this tank subsequently served in the supply role. It was returned to the UK after the war and exhibited as a Gate Guardian at Chertsey for some years. Around this time it was modified to resemble a Mark I, complete with tail wheel assembly and fitted with sample Male and Female sponsons. 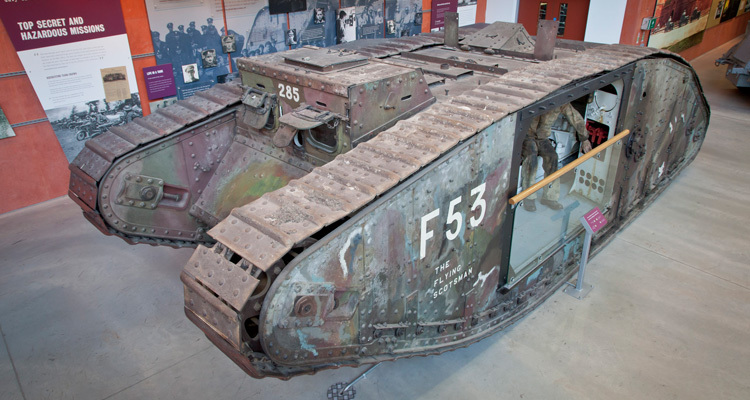 In this guise it subsequently came to The Tank Museum, bearing the name HMLS Dragonfly. With the arrival of the Mark I Hatfield Tank, it reverted to a Mark II, remained a hermaphrodite, and was later renamed Flying Scotsman when the lettering was detected beneath later layers of paint. Strangely there is no trace of the name Flying Scotsman in 6th Battalion records.